How will Ronda Rousey repay Triple H and Stephanie McMahon? After Ronda Rousey forced Raw Commissioner Stephanie McMahon to apologize for slapping her at WWE Elimination Chamber, Triple H laid out Raw General Manager Kurt Angle with a cheap shot that left The Olympic Hero laid out on the mat. 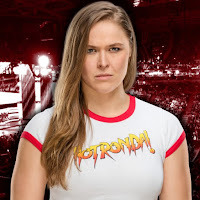 Following the altercation, Rousey took to social media to remind Stephanie and The Game that "This is far from over," hinting that retribution for their actions was forthcoming. Whatever Rousey does next, you won't want to miss it. - Here is the latest WWE Network Pick of the Week video, featuring a behind-the-scenes look at SmackDown Women's Champion Charlotte Flair giving a plug for her Photo Shoot episode. - WWE posted this behind-the-scenes video of RAW Women's Champion Alexa Bliss and her harrowing experience from the first-ever women's Elimination Chamber match.